Gear couplings are made up of hubs which attach to the machinery shafts, and sleeves that span the gap from one hub to the next. Sometimes the sleeve is one piece as in the Sier-Bath & HercuFlex continuous sleeve couplings and sometimes each hub has its own sleeve which in turn bolts to the other half or other side of the coupling. The gear teeth are found on both the hub and the sleeve of the flexible unit. The rigid or non flexing piece could be a flange without teeth as in the Sier-Bath "F" & new HercuFlex "FX" type or could be a hub with straight teeth that acts like the fit of a spline shaft to a spline hub as in the Sier-Bath "C" & new HercuFlex "CX" type. The flexible half coupling consists of a flexible hub and a sleeve. The hub that attaches to the shaft is also the part with the crowned teeth. The crowning includes tip crowns, flank crowns, and chamfers on the sharp edges. Crowning helps improve tooth life as well as misalignment capability. By crowning the teeth we improve the contact area from tooth to tooth and reduce the pressure of the torque forces. It also prevents the sharp edges of the tooth from digging in and locking the coupling. Sleeve teeth are straight except for a chamfer on the minor diameter edge. The gear teeth are narrower than the gap between the teeth. That space is called the backlash or if you will the looseness of the fit. Gear couplings always have some backlash. In addition to contributing to the misalignment capabilities, the backlash also provides space for the lubricant. Lubrication is necessary for gear couplings to work well. Some gear couplings have more backlash than others. In addition to the backlash there is another matching fit on the hub to sleeve interface. That is the "major diameter fit". 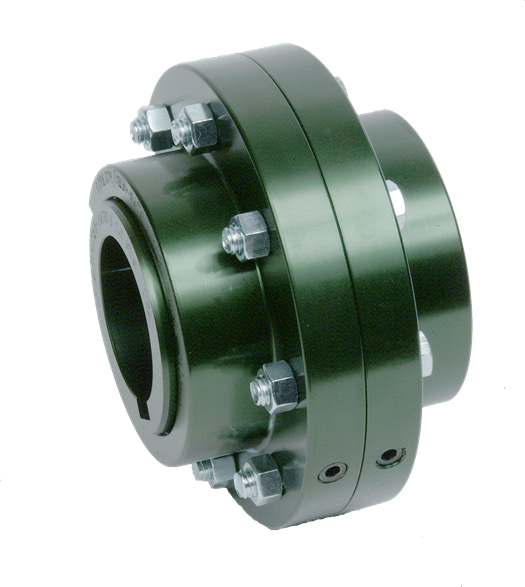 Gear couplings are made to fit closely at the major hub diameter and the root diameter of the sleeve. When the coupling is not rotating, those two surfaces rest upon each other if it is a horizontal installation. In operation the teeth mate at the pitch line, and that is where torque is transmitted. Minor diameter fits would preclude suitable misalignment capability and torque transmission capability. Rigid hubs are basically a flange, fitted to the shaft and bolted to the adjacent ½ coupling. Rigid "C" and "CX" couplings utilize one hub with straight teeth that mate with the continuous sleeve. The straight tooth rigid hub fits very tightly into the sleeve because there is very little backlash. We do not want the rigid hub to flop around as it could cause vibration problems. The hub and sleeve of the gear coupling are also fitted together so as to prevent the lubricant from leaking out. Most gear couplings are lubricated with grease. When oil lubrication is used it is usually a continuous flow through the tooth mesh. Oil lubrication is a special case. The sleeve to hub interface at the boundaries can have elastomer rings, gaskets, or labyrinths to prevent grease leakage. The continuous sleeve or "C" and "CX" type of gear coupling is not bolted together. That is an advantage in that the coupling can be made smaller and lighter. Smaller, lighter couplings also have lower inertia values. Lower inertia is an advantage when starting the machinery. Another advantage of no bolts is no bolt stress. The bolts can be the weak point in some applications. Under some conditions of balance and high speed the bolts are also detrimental. Lovejoy's Sier-Bath and HercuFlex flanged sleeve ("F" and "FX") gear couplings are built to American Gear Manufacturers Association (AGMA) dimensions up to size 9. That means a Sier-Bath or HercuFlex flanged series coupling will mate half for half with all other gear couplings built to AGMA standards. While AGMA standards are US based, many European manufacturers build to match the dimensions. Matching dimensions include the interface only, such as outside flange diameter, number of bolts, bolt size, bolt circle and gap. Many times the length through bore of the hub is identical. No promise is made about torque or bore capability. Lovejoy like other gear coupling manufacturers use similar nomenclature to identify the coupling sizes. Each company publishes an interchangeability chart up to size 7 at least. We could look at the plane of flexibility as a pivot point on the connection of shaft to shaft. An elastomer coupling has one flex plane where the elastomer distorts to provide the angular and parallel capability. A full flex gear coupling has two pivot points at the two gear meshes. A disc coupling has two sets of flexible metallic elements that distort to provide the misalignment. Except for elastomer couplings that distort in two directions, a flex plane only provides for angular flexing. In a gear coupling that angular flexing is generally 1 1/2°. 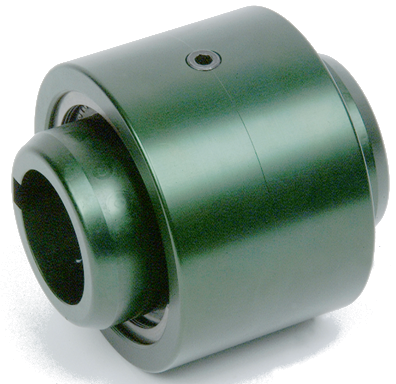 Special design spindle couplings have more capability. For other types of couplings you should refer to the literature as no two coupling types are alike. Two flex planes, each providing some angular flex, are placed in series to obtain parallel misalignment. The greater the axial distance from one flex plane to the next, the greater is the radial or parallel capability. Spindle couplings, and floating shaft couplings provide the maximum capability. Spacer couplings are also good for extra radial displacement and close coupled couplings such as a standard flanged sleeve gear coupling provides the minimum. Flex-rigid gear couplings provide only angular misalignment. There is only one flex plane. No radial capabilities are provided by the flex rigid coupling. The teeth can tilt within the mesh, but that is all the displacement allowed although backlash could allow for some radial misalignment too. Single element disc couplings also provide for angular misalignment only. Single element elastomeric couplings may distort enough to displace both radial as well as angular misalignment. Axial misalignment is also handled by the gear coupling. Axial displacement is available from either the full flex or the flex rigid unit. The amount available depends on many factors, and in fact specials are available for long sliding applications. Axial misalignment or movement is often associated with thermal shaft growth and floating rotors. It is accommodated by the sliding action of hub tooth within sleeve tooth. The axial movement can be stopped with a plate or a button. Other types have little or no capability in that plane of misalignment; some elastomeric couplings even have difficulty stopping the axial f1oat after a specific distance and may fall apart. There are many combinations of angles and spacing which can be calculated by plane geometry, to obtain the ideal situation for an application. Always keep in mind that equipment should be aligned to the rotating equipment manufacturers' standards and requirements, not only the coupling manufacturers. When operating misaligned, the coupling could transmit reactionary loads or vibrations that are within the coupling capabilities, but not the equipment capabilities. Nuts and bolts, grease seals, back up rings and gaskets are all needed for the gear coupling. Except for the bolts, these items are used for holding grease in the coupling. Sometimes these items limit the coupling application. For example, the temperature may be limited to the o-ring capabilities. Misalignment may allow grease to leak out the seal surface, or some modifications may need a wiper seal rather than an o-ring. The seals can be held in place by several means. The o-ring is the most simple, and it fits into a groove in the sleeve. Sometimes the seal holder is bolted to the coupling sleeve. This is always the case on couplings larger than size 9. It makes the assembly of the coupling to the shaft easier, and makes replacement of seals easier. These couplings with bolt on seal carriers are designated FHD. "F" series couplings 7 through 9 can be either the "HD" version or the plain version. The "FA" type of Sier-Bath & "FX" HercuFlex couplings uses a high misalignment seal with more flex than the regular seal. The "C" coupling seal is held in place by a "spirol" ring and it has stiffeners molded into the inside face. It is a U or C shape that stays closed under load. It also provides the movement limit for the coupling and is actually rated to withstand an end force. Grease of course is an important gear coupling accessory. Coupling grease is not ordinary grease but is specially formulated so the oils do not separate from the soaps. The result is that the lubricant is contained within the needed space and sludge is not allowed to accumulate. Oil and soaps separate in ordinary lubricants because of centrifugal forces on the heavier particles. Couplings often must fill a space between shafts as one of their primary attributes. It would seem a simple enough task, but not all couplings offer flexibility doing that job. This is another reason why the gear coupling is very popular. The distance between shaft ends of rotating machinery must vary to accommodate design standards, product line variations, different motor frames and maintenance needs. A gear coupling can meet those needs in a variety of ways. If the gap between shafts is small the coupling can utilize its capability to reverse the hubs or face off the hubs. An infinite number of possibilities is can be obtained from catalog minimum to catalog maximum. Note this gap does not affect the distance between flex planes unless the hubs are reversed. One or both hubs can be reversed. Sometimes a spacer piece is used to allow for maintenance space or machine removal. Spacers are built to standards for the machinery builders. Pumps have several standard spacers such as 3 1/2 inches, 7 inches and others. Compressors would have a different set. Spacers use two ½ couplings and one flanged hollow tube to connect the coupling halves. Spacers can serve to separate the flex planes and can be part of the torsional tuning of a coupling. Spacers have practical limits on length that are associated with cost, weight and critical speed. When the spacer becomes too costly, the next step is to use a floating shaft coupling to achieve the necessary spacing. The primary reason for a long floating shaft is to achieve greater radial misalignment between shafts. The secondary reason is to reach a long distance between the driver and the rotating equipment. 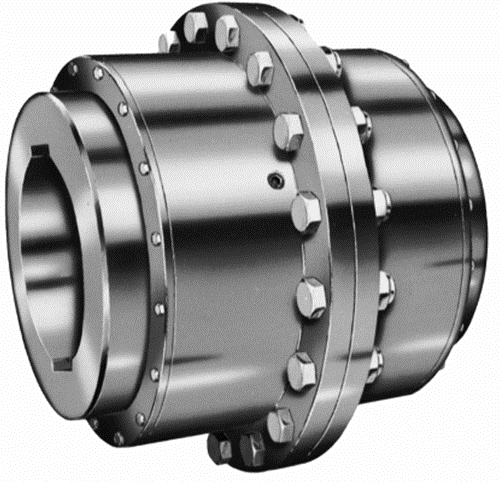 The floating shaft coupling consists of two flex rigid couplings connected by a piece of solid shafting. Floating shafts are found on bridge cranes and steel rolling mills. Weight and critical speed are important considerations for floating shafts. Gear couplings can be modified to allow shaft growth in the axial direction and to limit growth in the axial direction. Limiting the growth calls for a plate and possibly a button to be inserted between the coupling halves. As the shaft tries to move in the axial direction it is stopped after moving a predetermined distance. That is what we mean by "limited end float". It is necessary with sleeve bearing motors. Sleeve bearings are often used in the large motors over 200 horsepower. Those same plates and buttons are used on vertical couplings. Sometimes it is not movement that we want to stop, but the electrical current known as galvanic current. To do that we offer an insulated coupling. One half of the coupling is electrically insulated from the other thereby interrupting the flow of current. It is done by adding insulating plates and bushings. Galvanic currents are the cause of pitting and corrosion at close running fits of mechanical equipment and of the gear teeth. It is not necessarily a high voltage insulator as found in wiring systems. On the other hand, the gear coupling can be arranged to allow axial float, as would be required by thermal growth of a shaft in a hot application. Many couplings can be set to allow some thermal growth, but only the gear coupling freely slides back and forth without adding to the load on the flex element. In addition to thermal growth, gear couplings can be arranged to slide great distances. The long sliders are used for removing equipment from the system where the coupling is the most suitable point of movement. Medium sliders are used when the coupling must adjust axially while the machinery is in motion doing its job. Refiners, Jordan machines, and roll winders found in paper mills utilize the sliding capability. Spindle couplings also have some slide capability to adjust to the installation or operational requirements of rolling mills. Some applications extend beyond the traditional coupling requirements of torque transfer, misalignment, and filling space. A simple case is the vertical coupling. When the coupling is mounted vertically, the forces and weights need to be accounted for, since, we cannot allow them to interfere with the misalignment action. For gear couplings we must account for the sleeve weight and potential movement. That is accomplished by adding a plate and button as mentioned before under the limited end float discussion. The button is rounded to allow the load to transfer under misalignment. The load or weight is transferred to the lower shaft and thence to a thrust bearing in that equipment. Hanging load couplings in turn transfer the load upward to a bearing in the upper coupling. In a vertical floating shaft coupling the entire floating assembly rests on the lower shaft and must be accounted for by the designer. Gear couplings can be configured to do special jobs. We already discussed the slider possibilities, other possibilities include the shear pin, cutout, and brake coupling. Shear pin couplings disconnect when subjected to predetermined torque overloads thus protecting other equipment. Torque overloads could come from stalls or cyclic overloads. Cut-out couplings, which can be automatic or manual and include pins to hold them in position, function as a disconnect or a connect coupling. They could be used on a dual drive machine to isolate the unused driver. They could be used for a temporary connection for adjustment of a rotary shaft, in which case they connect and disconnect on the fly. They could also be used for a turning gear that rotates heavy equipment when it is off line, and helps prevent a permanent set in the shaft. The cutout pin holds the coupling in one position or the other. A brake wheel or brake disc coupling includes a brake device on the coupling. It is a matter of space conservation in some systems to put the brake on the coupling. In other situations putting the brake at the coupling prevents the high cyclic torque from reaching low torque shafts. Brake wheel couplings are often attached near the gear box shaft since the gear inertia is in the box. At the beginning of our discussion of gear couplings we mentioned that gear couplings are capable of very high speeds. They can do speed and torque at the same time. The limit has always been the need for lubrication of the mating gear surfaces. While high speeds increase the wear rate and can be the cause of high stresses within the coupling, the big issue is balance. Couplings operating at high RPM or high rim speed will cause vibration problems if they are not in balance. Balance and radial deflection also plays a big role in the issue of lateral critical speeds. Coupling balance is achieved through design, manufacturing and balancing machines. Without going through a complete dialog of motion mechanics, let us say that balance concerns itself with how the weight of the rotating mass or inertia is positioned or displaced relative to the center of mass. If that weight is perfectly distributed around the center of rotation and the center of the coupling, the coupling is in balance. Since nothing is perfect in couplings and some other issues in life, there is always a potential unbalance. Some of the potential unbalance is a result of machining tolerance. Off center, out of round, non-parallel or even loose fits lead to mass displacement. In castings some of the potential unbalance could come from voids or air space internal to the casting. When a coupling consists of an assembly, the design and the assembly process can result in an unbalance condition. To have the best balance it is necessary to be balance proactive in the design and tolerances, and to have very tight tolerances. The final step then becomes one of putting the coupling or its components on a balance machine to measure the unbalance and to take some countermeasures. Countermeasures usual involve removing material in certain areas to compensate for the mass displacement. Balance is also accomplished in some cases by addition of material. In the end there will always be some residual unbalance. Residual unbalance specifications and balance methods are the subject of several standards. The standards apply to all types of couplings even low speed units in some cases. Specifications have been developed by AGMA, ISO, and API to name three. Individual OEM customers may have their own standards that are usually taken from the recognized standards listed previously. Imperial unit unbalance is measured in inches (usually micro inches), or in oz-inches. In the former case the dimension locates the center of mass relative to the rotation, while in the latter case the unbalance is identified in both weight and distance. Many specifications base the standard on operational speed as well. Gear couplings present a special case for balance problems. A gear coupling has a backlash and loose fit between the teeth so it cannot be spun on a balance machine while assembled without modification. The gear coupling is assembled with a slight interference on the major diameter, balanced, disassembled, ground at the tooth tips and reassembled for use in the application. Gear couplings will not work without the looseness at the major diameter. While balance is very important to high speed gear couplings, it must also be noted that high speed has the potential for high wear of the teeth. Extremely high speed units utilize hardened teeth to extend the coupling life. Slider couplings have hardened teeth in some applications too. In a misaligned gear coupling the hub teeth and sleeve teeth constantly rub together. That is the wear mechanism that eventually causes the demise of the coupling. It is necessary to change materials of construction to harden the couplings. The material to be used must be compatible with induction hardening, carbonization, or nitride hardening. When the tooth is hard it must retain its strength to still carry the torque. Iron carbides and carbon nitrides provide the surface hardness. While 1045 carbon steel is a popular standard steel for gear couplings, Lovejoy also uses 4140 and other high alloy steels. Lubrication is certainly necessary to decrease the wear and reduce the friction between the mating teeth. High speed couplings have oil lubrication. The oil, which is circulated through filters and coolers, is sprayed into the area of the teeth on one side and drained from the coupling on the other side of the teeth. Grease would pose temperature rise problems, might centrifuge out of the area needing lubrication, and would break down requiring re-lubrication. Circulating oil has the advantage of constant renewal. There are several magic numbers when it comes to gear couplings. One is the size cut-off between big and small. That number is arbitrarily set at 7, but could be 9. The AGMA dimensional interchange goes to size nine for gear couplings. Once the size rises to 7 and above, the number of applications and therefore sales are very limited. A size seven gear coupling has a bore capability of 9 or more inches (depends on key size too) and a torque of approximately 1 million inch pounds. That torque corresponds to 16,000 horsepower at 1,000 RPM. Not many applications go that far and when they do the situation is special. Usually big gear couplings are used on very low RPM and very high torque applications as found in the steel and aluminum rolling mills, mine concentrators, crushers, or rubber processors. While Lovejoy's gear coupling catalogs will show gear couplings up to size 30, Lovejoy's Downers Grove, IL and South Haven, MI facilities make and stocks gear couplings up through size 15. Going above a size 15 (very rare & very large couplings) requires Lovejoy's coordination with an outside machine house and will add to a given product's lead time. Very large gear couplings (i.e. - above size 15) are often re-rated based on improved materials, heat treating, and hardening. In reality the user and designer are trading wear life for torque rating. The torque rating can be used as a peak load or cyclic high and not always the normal operating torque. The transmission shaft is loaded with torque only on these applications so shaft capability is the same as or greater than the coupling. We can offer that re-rate service, which in turn reduces the coupling size, as long as the bore capability is not exceeded.